1. This might be only interesting of course in terms of the Ancient Astronaut debate which seems to go off in a multitude of directions but it seems that I'm doing everything I can to break the symbols of Palenque tomb down and show other depictions of these things but there is still some contention about what the man in the Mayan Rocket Man tablet is doing while not actually flying a spacecraft. The shamanistic interpretation appears to show something slightly different from the hardline archeologist's interpretation, it's all a question of whether he is going up or down, and then maybe what the idea of an airborne capsule might mean to a Mayan even if it's made up from symbolic representations of monsters and a tree . 2. Meanwhile the study of Ancient Sumerian Tablet isn't really heading anywhere in terms of Zechariah Sitchin's stories about the Annunaki because they didn't use the most talked about one that appeared to feature stars or planets or whatever they are. But it's almost historically interesting to look at how far the image of a large throned man and the people coming up to him go back in time, and how the person who made the Prometheus tablets merged the ideas from two of them together. However putting a halo and angel wings onto the giant really didn't do much for the picture. 3. I certainly wish that the tablets in the movie could be redesigned to the level of oddity of Giger's Alien Life Cycle Hieroglyphic. I'm trying to work out whether this is another point of exploration or not because it's a bit odd like a 80s pop culture reference. Find the connection between the photo and the words printed in it. 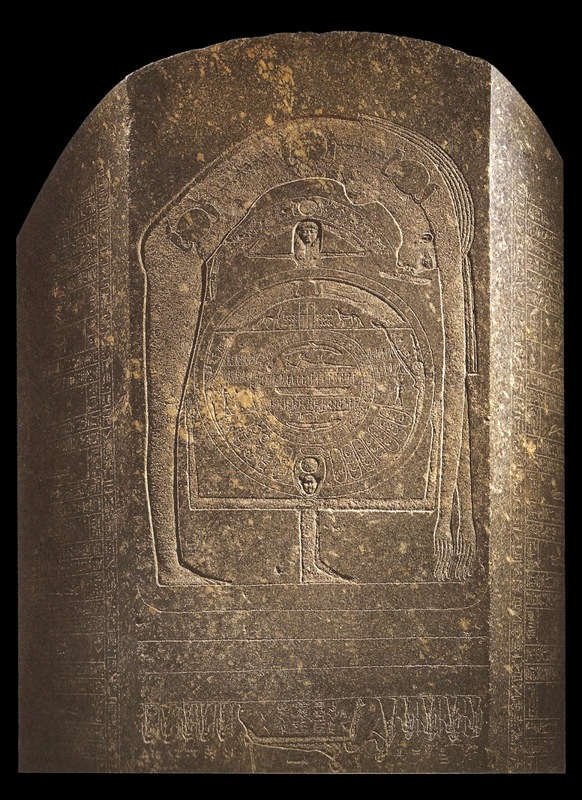 Have now included the Was-Sceptre as part of the H.R Giger's Egyptian Mysteries section. Don't know whether to say it is a directly something that inspired the Necronom IV head but definitely seems like a part of the shadow behind the thinking. Thanks to Batchpool from Prometheus-movie.com for pointing out the similarity. The Was Sceptre, the head of the alien? Starting to create pages about the Fifield mutant, nothing really anything of interest to reveal other than a photograph from June edition of Le Cinema S.F.X of a CGI representation of an unused concept for the creature which I haven't seen anywhere else yet. 1) Set of images tracing the design of the Facehugger's sculpted underbelly. Okay, I've tracked down the comic story from Weird Science that inspired Dan O'Bannon in the 1950s and you'll probably be delighted how obvious it is. 2. Thanks for the information from "egoc", two paintings by Ernst Fuchs, Behind Veronica's Cloth (from 1953) and The Angel Of Death Over Purgatory, (from 1951 to 1956) have now been added to the Design origins of the Alien by way of "Swiss Made"
Here's a section about the auto destruct panel with the buttons painted in by Simon Deering who revealed his secret about the strange words on the buttons back in 2009. A fairly decent scan of the Sokar Funerary barge from the Egyptian Book of the Dead Papyrus of Ani has been added to the Evolution of the Space Jockey from the Egyptian Book of the Dead. Previously a black and white one along with a low definition colour version of this simple illustration had been put there, but now, well I sorted that out yesterday. Updated the section "Pyramid In The Prequel", nothing particularly new that anyone hasn't been talking about in view of the new shot of the face on the top of the pyramid mound, but attempts are being made to organise the information and the origin of each piece of information, so well each photo from the trailers can be found with a link to the original trailer. This is to help me as much as anyone else while we are in the process of piecing everything together from the trailers and featurettes as they deliver us revelations to get excited about rather than see it all on the big screen, it's getting more and more complicated. Pyramid In The Prequel. 1) It probably seems a little bit hazy, but gleefully I add another part to the H.R Giger's Egyptian Mysteries with the discover that Necronom IV seems to have been inspired by at least one of the images depicting the Ancient Egyptian Embalming Ritual. 2) And I've updated Design origins of the Alien by way of "Swiss Made" page with a new section "Elongated Skull Apparitions" See part ii or 1 at Development of the Necronom IV. 6 sketches for an Alien Queen for Steve Johnson's Edge FX bid to do the creature suits for AVP. New turn discovered in the evolution of the Space Jockey design! I think I may have discovered depictions of of Rambaldi's early concept for the Alien creature. Possible inspiration for the leap to having the Nostromo refinery platform as a squarish shape. A smallest update in the section dealing with the medical inspiration for the chestburster, a newspaper article about Jason Zinoman's "Shockvalue" recounts the story once again about how the effects of Crohn's disease provided O'Bannon with the personal inspiration. Number six at the end of the page. Compilation of various thing that excluding the aliens themselves, Paul Anderson borrowed from the Alien saga for ideas and tributes in his Aliens Vs Predator movie. There has been some sort of bug in the blogs programming so excuse me if the spacing seems rather up the wall on some pages, I might have solved the problem, I don't know.